Are you interested in purchasing carbon offsets? Certified carbon offsets from Second Nature’s Carbon Credit and Purchasing Program (C2P2) are available on a yearly basis. The Carbon Credit and Purchasing Program enables leading colleges and universities in the Climate Leadership Network to sell their carbon reductions as a strategy to finance deeper emissions reductions on campus. To be eligible, campuses must perform within the top 15% of their peers in the Climate Leadership Network in terms of annual greenhouse gas reductions. Schools can generate offsets by reducing their campus-wide energy-based emissions, or through a top-performing LEED certified building. All offsets are third-party certified to the Verified Carbon Standard. As part of the Climate Leadership Network, each school generating offsets is committed to achieving carbon neutrality. These schools are driving forces for clean energy innovation, and models for other higher education institutions. Schools reinvest all revenue from carbon sales into further emissions-reductions projects on campus. This allows schools to move more quickly towards carbon neutrality and finance larger scale projects, for which they would not otherwise have capital. Each project involves students, faculty, and staff on campus in a variety of capacities, ranging from hands-on implementation of new technology to academic research and published work. These educational benefits expand the projects’ impacts far beyond simple carbon reduction. Campuses can purchase offsets from the C2P2 projects to fulfill their Carbon or Climate Commitment. Offsets purchased through C2P2 can be applied to any scope of GHG emissions to meet emission reduction targets or carbon neutrality. Purchasing offsets through C2P2 helps other schools in the Climate Leadership Network achieve their goals. Email Ruby Woodside, rwoodside@secondnature.org, for more information. Ball State’s geothermal project is the largest of its kind, and eliminated the school’s reliance on coal. Ball State University created the nation’s largest ground-source, closed-loop geothermal energy system. This project replaced the school’s coal-fired boilers and chilled water equipment, and achieved a seven-fold increase in efficiency. The dramatic emissions reductions allowed the school to move its target carbon neutrality date forward from 2050 to 2030. In addition, the geothermal system has served as research material and classroom curriculum for hundreds of faculty and students. The UWM President signed the Climate Commitment in 2016 and committed the school to carbon neutrality and climate resilience. 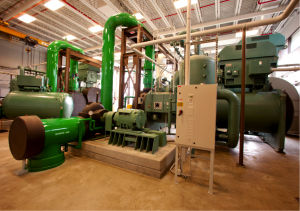 The University of Wisconsin Milwaukee (UWM) reduced its Scope 1 emissions by a yearly average of 11.79%. These reductions were driven by an aggressive campus-wide program focused on improving campus space and service, piloting innovative technology, and reducing energy consumption. Energy conservation measures included lighting retrofits, occupancy-based heating, and cooling load improvements. UWM also incorporated behavior change initiatives among students and staff, developed an on-site solar PV system, and built three LEED-certified buildings between 2011-2016. 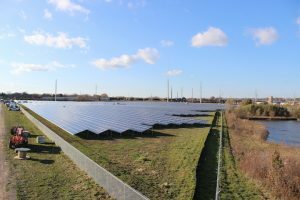 UIUC generates approximately 7,000 MWh annually of solar energy, and promotes renewable energy adoption in the community. The University of Illinois Urbana-Champaign (UIUC) increased building energy-use efficiency across campus through a program of aggressive retro-commissioning and upgrades, reducing energy use by over 25% across 40 buildings. UIUC also implemented renewable energy and LEED certified buildings on campus. 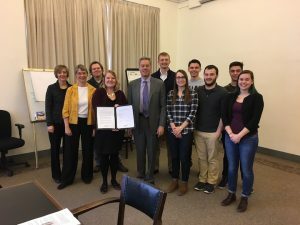 Students, faculty, and staff across campuses helped UIUC achieve its sustainability goals, from pledging to take action to reduce energy use to working on teams that identified energy efficiency projects. SOU’s LEED certified dormitory buildings incorporate sustainability into the daily routines of students. Southern Oregon University (SOU) generates carbon offsets from two LEED-certified buildings on campus. SOU built two new LEED Gold-Certified dormitory buildings that house approximately 700 students. The high-performing buildings include rooftop solar installations, lighting sensors, advance controls to reduce energy use, and daylit common spaces among other features. They also incorporate sustainability education for the residents living there. 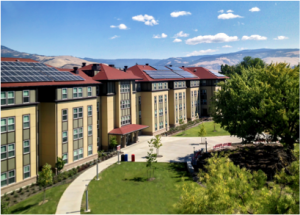 These dormitories were the first LEED certified buildings constructed in Ashland, Oregon.